Let’s have Mick Rory do the opening narration every week. Mick has quickly become my favourite character on his show and brings so much laughs on a show that is becoming more fun as the weeks go by. This week, Mick gets into a bromance with George Washington. What leads to that is the team is alerted to a huge time quake where Washington was murdered on Christmas Day 1776 just before he crosses the Delaware. With Washington’s death results in America never getting born. Sara knows this is a trap set up by the Legion so she is extra cautious. The Legends go back to Christmas Eve 1776 Pennsylvania. Mick goes undercover as a private in the confederate army and he and Sara are tasked to bring Washington to safety while Nate and Amaya pose as newlyweds. Jax and Martin run point on the Waverider while Ray is shrunken down in the Atom suit. As anything that happens with our Legends things don’t go smoothly especially when they encounter Rip in a Redcoat uniform who uses an EMP to disable the Waverider, the Atom suit (meaning Ray is stuck shrunk), and Mick’s gun. Rip shoots Sara and the Redcoats take Washington and Rip. Meanwhile, Sara is brought back on board the Waverider but with the power out, they cannot access Gideon. Jax and Martin try to become Firestorm to take out the bullet in Sara but find they cannot because the power is out. Before Sara passes out, she gets Amaya and Nate to go after Washington and Mick while leaving Jax as the temporary captain. Ray is tasked in turning the power back on and Martin is tasked in saving Sara’s life. 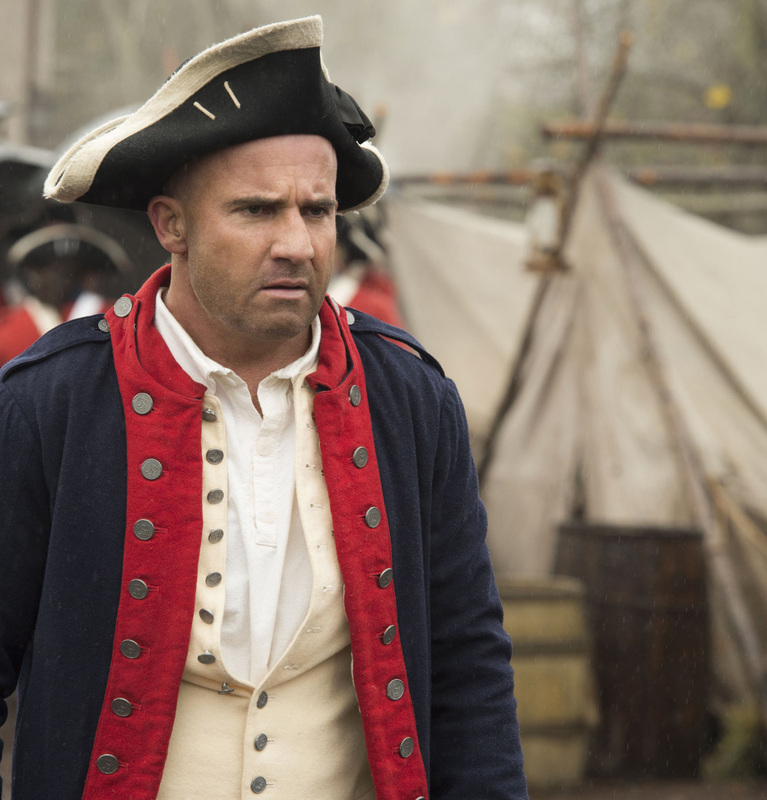 Outside the Waverider, Rip is trying to break in with a couple of Redcoats to get a part of the Spear of Destiny. They do get in and Jax manages to booby trap the place to take out the soldiers just leaving him and Rip. Jax is trying to convince Rip not to turn on his team but Rip likes what the Legion has done with him. Rip even tries to get Jax on his side by saying they could use the Spear of Destiny to save his father. Jax refuses to join Rip. However, Jax finally tells Rip the location of the Spear when he threatens to snap Sara’s neck (this is after Martin pulls the bullet out). Jax pleads with Rip not to hurt Sara but he kills her anyways saying that she doesn’t mean anything to him. After evading a rat in the Waverider’s ducts, Ray manages to power up the Waverider. Gideon comes online and saves Sara. Over to Amaya and Nate who are tracking Washington and Rory when they get ambushed. Nate falls into the river and Amaya harnesses the power of a seal to save him. Their part of this episode is to address the chemistry that has been brewing between the two. Earlier the two were talking about the differences in dating in 1939 versus 2017. Nate says things like Tinder has made dating more relaxed and no expectations. Amaya says dating or courting to her usually leads to marriage. The whole point of the river scene is that Nate is super cold that Amaya needs to use her body heat to warm him up. This leads to the two of them sleeping together. Of course later Amaya tells Nate that what happened to them was just casual and won’t happen again. We see that Nate is disappointed as he clearly likes her. Back to the bromance. Mick somehow inspires Washington not to give up and when the team does manage to save America, we see the end result is that Mick has a statue erected of him in Washington, DC. Jax is so enraged at Rip for killing Sara that he goes after him and is ready to shoot him. When Sara catches up with him, she talks Jax down from making a big mistake. When everyone is back on the Waverider, the Legends celebrate Christmas. Sara toasts the team that what makes them work is they are family.